Finally - a really good watch! I must have had dozens of watches over the decades. When I was a kid, I even had a pocket watch - Smiths, I seem to remember! Then Timex became the budget brand of choice. When I was in my thirties, the era of the digital watch began - probably the first item of digital consumer electronics to hit the market. I couldn’t resist the first - or the first affordable one, anyway: the Sinclair Black Watch. This had a tiny red LED display, and you had to press a button to light it up - otherwise the battery wouldn’t have lasted five minutes. 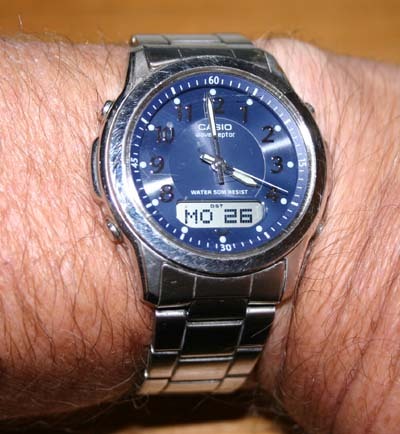 The watch didn’t last that much longer, and was replaced by a succession of Casio models, all made of chrome-plated brass (in those days only very expensive watches were made from stainless steel). When my sweat dissolved the chrome, the exposed brass corroded, leaving my wrist and shirt-cuff with a green stain. I stayed with cheap - mostly digital - watches until my Dad died in 1990 and I inherited the Tudor Prince Oysterdate he’d been awarded for 25 years’ service by BP Chemicals. This was from Rolex’s budget range, with a genuine Oyster stainless steel case but, presumably, a cheaper movement. Good secondhand examples now fetch about £1000. Believe it or not, this watch never kept good time. despite my Dad sending it back to Rolex several times for service under the warranty. Even more surprisingly, back in the eighties I had a colleague who was a bit of a poser and wouldn’t be seen dead without a Rolex. He had the ’proper’ Rolex version of the same model - and that didn’t keep good time either! I wore the watch for some years, for sentimental reasons really because I’d been used to digital watches that were accurate to a few seconds a year and I found the Tudor’s poor performance really irritating (as if it really matters if you know the time to the nearest second - or even minute!). Then it seized up completely sometime in the mid nineties and I wore a succession of much more accurate watches bought off market stalls, discarding each as the chromium plating wore off and the metal underneath began to leak green grot. Around 1997, without my knowledge, Patricia sneakily sent to Tudor back to Rolex and paid the exorbitant standard service charge as a Christmas or birthday present. I wore it for a few years - again putting up with its poor timekeeping - until it siezed again. This time it went in a drawer, where it has lived ever since. I had recently bought Patricia a solid titanium (and therefore totally anti-allergenic) Citizen watch, and we had been very impressed with this. I remember taking it into a Citizen-dealing jeweller in Florence for have a link taken out of the bracelet, and him remarking that this was a very good watch. So I decided to let her buy me a Citizen, also in titanium, but a complicated chronograph with loads of buttons. Both these watches had solar charging. We discovered a problem with her watch (once the warranty had expired): the perpetual calendar - the kind that knows all about ’thirty days hath September’ and leap years - wasn’t set properly. Worse, there was no way of finding out what year or month it thought we were in and no sensible way of changing this even if we did know. So to this day the date function is useless. When I had problems with my calendar, I was very glad of the chrono buttons, because it was possible to program the year, month and date using these and all the little dials. Unfortunately, in the course of doing this, I discovered that one of the buttons was stuck in the in position and I had to pull it back out with pliers. After doing this a few times, the button came right out, jumped out the the jaws of the pliers and vanished into the sawdust on my workshop floor, never to be seen again (titanium is non-magnetic so I couldn’t find it with a magnet). When I was told that the standard service change for my watch was £135, I decided to cut my losses. Since April 2009 I’ve been wearing a Casio again. To be fair, Casio have moved a long way up-market from the days of black plastic and chromed brass. Regardless of brand, this is by far the best watch I’ve ever owned. It’s also the most accurate I’ll ever wear. The design is classic rather than modern - actually very similar to the Tudor Prince, except that it has four buttons spaced around the case and no crown (winder). The band is as near identical to the Prince’s as makes no matter, and if anything a bit more solid. However, it lacks the rows of holes that allow the Prince’s to be adjusted over a wide range - there are just two pairs of holes, so for further adjustment links have to be added or removed. The blue-black dial has large, clear silver numerals and luminous hands, but there is also a small liquid-crystal display which, by default, displays the date with quite large letters and numerals - so today’s date, Tuesday 20th, shows as TU 20. Above these very tiny function labels appear. So far, so simple. It’s an analogue watch with a clearer-than-usual digital day-date function. But inside lurks a powerful little computer with a good range of functions and an intelligently designed user interface. And there is a very clever radio receiver: hence the name ’Wave Ceptor’. At 01:02 or 02:02 every morning, provided the watch is within range of a window, this picks up a signal from an atomic clock transmitter and sets the time on the watch to a quite insane level of accuracy. If I have an analogue radio on at the turn of the hour I have the great - and silly - satisfaction of watching the second-hand click to the 12 mark just as the final long beep of the Greenwich Time Signal starts. Even better, if I’m listening to the radio on DAB or digital TV (Freeview or FreeSat) I can see just how inaccurate their broadcasts of the pips are (they’re all slightly different)! This works just as well in the depths of the Normandy countryside as in the UKe, but I haven’t tried it anywhere else. There is one drawback to the time at which the signal is usually picked up - 01:02. At the solstices, this is almost an hour before daylight saving time starts or stops, so by the time I wake up my watch is out by an hour. Not to worry - it’s the work of a moment to trigger a manual time check. Talking of France, it’s also quick and easy to change to any of the other 23 time zones and watch the hands advance or retreat to the correct local time. Or, if I just want to check what time it is elsewhere in the world, I can just pick a city name and see a digital local-time display. Much more useful, though, is the stopwatch. I use this on every one of my morning walks, and it takes just three button-presses to switch it on, one to start it, one to stop it, one to zero it and two to get back to the day-date display. There are lots more tricks up my Casio’s sleeve, and even more on more expensive models - mine cost £71.61 when I bought it from Amazon. You can get solar charging, like the Citizen had, but I decided was not worth the extra money and, over three years after purchase, I have yet to change my battery. If I’ve converted you, you can google ’wave ceptor’ to find details of all the current models. Like the inhabitants of the galaxy’s more primitive planets (according to the late, great Douglas Adams in The Hitchhiker’s Guide to the Galaxy), I used to think digital watches were a pretty neat idea. Someone still must, because there are loads on the market. However, as my vision has deteriorated over the years I’ve come to appreciate the benefits of a well-designed analogue watch: I can tell the time at a glance in low light levels and from all sorts of angles without my glasses - and my vision is now so bad that I can’t read the brightly illuminated digital display (with characters about 12mm high) on the Panasonic DECT phone that sits on my bedside table. That’s not to say I don’t also appreciate the clever things a digital watch can do - I love them, as you’ll have gathered. My Casio gives me the best of both worlds - analogue convenience and digital versatility, plus a ludicrous level of accuracy! In mid-January 2013, very suddenly and with no warning, my Casio’s battery died. The digital display went blank, the anlogue movement stopped moving and the buttons stopped doing anything. April 2009 to January 2013: that’s three years and nine months. A local jeweller fitted a new batter for £3.99 but when I tried to reset the watch I found that two of the four buttons were jammed. The boss of the shop sorted this out for me the following day and all is now fine - except that my watch is no longer as water-resistant as it was because it hasn?t been re-pressurised (a £20 extra, I was told). Ouch!